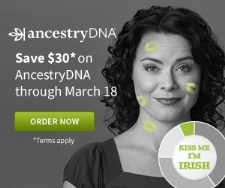 Canadian residents can take advantage of a St Patrick's Day sale from Ancestry DNA by purchasing a test kit for $99 CAD (plus p&p). That's a saving of $30 on the regular price of $129CAD. The offer will end at 11:59pm ET on Sunday 18 March.